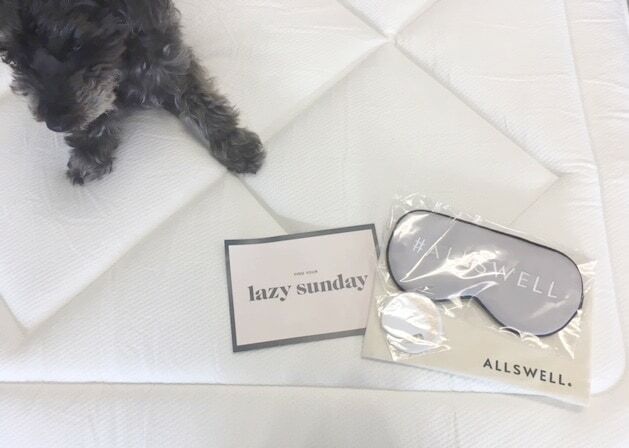 The Allswell Luxe Hybrid mattress is one of two mattresses offered through this new company. This option is their thicker hybrid option that pairs pocketed coils with three layers of memory foam. Along with an attached plush topper for extra comfort. This creates an ideal medium firm feel perfect for stomach sleepers and back sleepers who like more support. It would also work for the occasional side sleeper too and the best option for couples. Learn more in our in depth video review! Allswell has two ideally feeling mattresses that offer luxury at a very affordable price. The Luxe Hybrid mattress is a thicker, more plush feeling mattress that has an added topper to give it extra softness and ideal support. While the Allswell Hybrid is slightly firmer and thinner, but a great option too. This review we will focus on the Luxe option that really emphasizes getting superior quality at a price point for every sleeper. The thing that might stand out most about Allswell Home is not only their mattresses but their eye catching bedding. Their curated bedding can instantly make your bedroom look like a glamorous magazine photo shoot. The looks are current, varied and complete from sheets to throw pillows. In one false swoop you can get a mattress and remodel your bedding too. Not to mention this mattress comes with optional upgraded white glove delivery service as well as optional removal. A 100 night sleep trial period and 10 year warranty. Below we have our in depth analysis and detailed review of the Allswell hybrid mattress. We will go through the specifics on how it performed in comfort, motion transfer, sleeping cool and edge support. As well as how it rans for materials, delivery, value, trial and warranty. Also, learn more and shop at Allswellhome.com. With the Allswell mattress and bedding you will have the choice of delivery methods at checkout. Included in the price you can have the mattress sent in a box to your door with standard shipping. Otherwise, for $50 you can choose to have the mattress expedited to a two day delivery, getting it too you right away. It is nice to have the choice for this because sometimes you just don’t want to weight. When it comes to the getting the mattress it will show up right at your door either way. The box that it comes in will be fairly heavy and will be compact but take two people to maneuver. The set up process is simple. Take it out of the box, cut away the plastic and watch it come to life. Either way, this mattress will have very minimal, if any at all, noxious odor. The Allswell mattresses use CertiPUR-US foams with no ozone depleters, a chemical free fire barrier and no chemical deodorizers. There might be a bit of a natural fragrance, but nothing overwhelming. See how easy it is to unbox the mattress below! 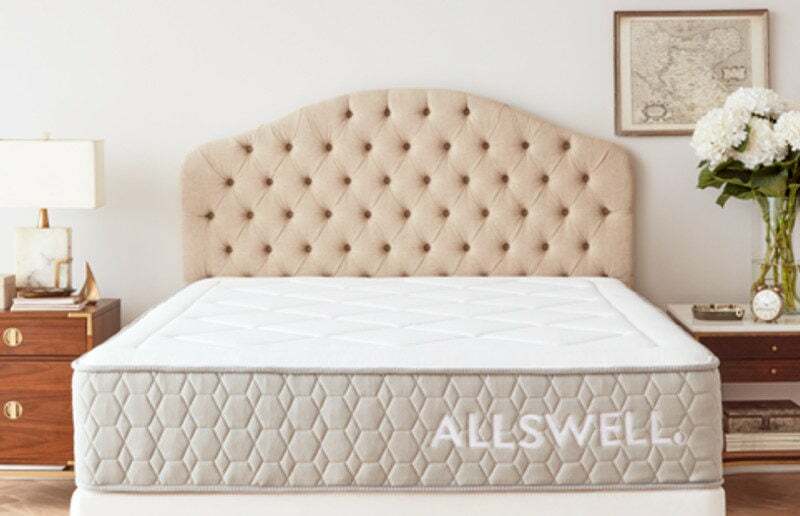 The Allswell luxury hybrid takes a sophisticated coil system and specialty foams to create a mattress that will be comfortable and ideal for most everyone. This 12″ mattress should work great for every sleeping position. It is a medium firm feel that works great for all shapes and sizes too. Making it great for back sleepers, allowing enough support and enough sink to alleviate pressure and make a sleep surface that cradles your lumbar and shoulders. It will also work very well for a side sleeper too, allowing plenty of cushion to allow your shoulder and hip and to sink in. 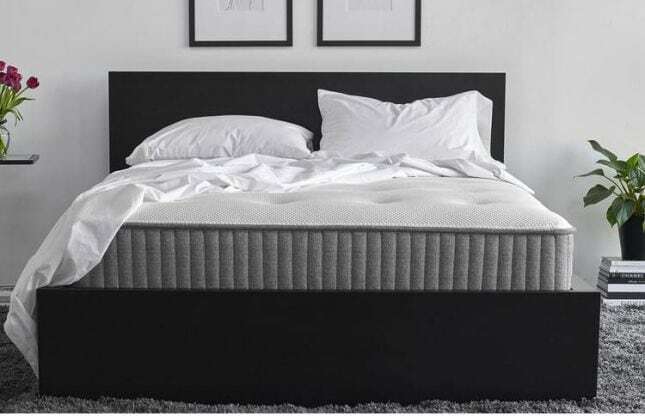 This mattress is even good for stomach sleepers, because even with the top few layers of comfort foam the coil system has plenty of support to keep your back from bowing. This mattress would even work well for heavier people too. Offering a substantial feel with ample support and plenty of comfort. Considering how inexpensive this mattress is we were quite impressed with the comfort and support it provided. Especially the perimeter support. The coils were sturdy and allowed you to change positions easily. While the top comfort layers were dense and more durable feeling. It definitely offered more of a medium-firm feel that was great for back and stomach sleeping. If you are a dominate side sleeper or like a little more contouring feel than a softer option would be better. But, all in all (pun intended!) the Allswell hybrid did a nice job of finding a balanced comfort that worked well for both of our sleeping styles. Allswell Home Coupons Found HERE! 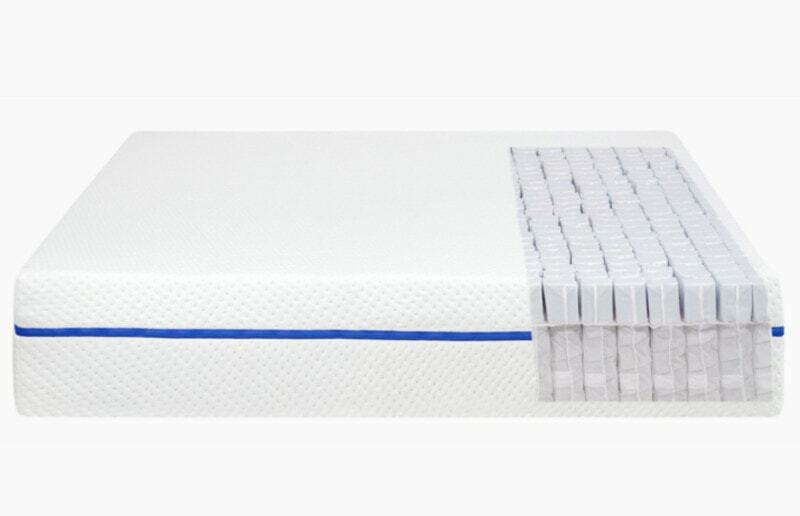 This mattress is a hybrid mattress that uses individually wrapped coils for the core support system and covered with 2 layers that make up 3.5″ of foam. It also has a thick plush topper too that adds additional thickness as well as contributes to minimizing motion transfer too. This mattress may have a bit of vibrations when moving but shouldn’t be disruptive. The coil system individually wraps each coil in fabric which alone will greatly reduce any motion transfer. It also has 1″ of conforming Air Flow foam and 2″ of super soft foam. The foams will absorb the majority of vibrations and make for very minimal motion transfer to be felt. This mattress should be great for anyone who shares a bed because of this, there will be little disturbance when getting in and out of bed. The Allswell firmer on hybrid mattress will do a good job of sleeping cool. The build of the mattress uses a solid coil system that is not only great for support but ideal for releasing any built up heat. It also creates a firmer surface that doesn’t let you sink in too much. Keeping more of your body on top of the bed for air to flow around. This mattress also incorporates a cool to the touch luxury cover that helps wick away moisture as well as maintains a soft and breathable feel. These aspects make for a mattress that doesn’t become too hot while sleeping. The edge support on the Allswell hybrid mattress is going to be solid and sturdy. It allows you to fully utilize the mattress from edge to edge and head to foot. The coil set used in this mattress provides great support throughout that makes for a more usable perimeter. This mattress will feel very consistent across the top. The edge support while sitting should be fine for sporadic use. One of the first things that stood out to us on the Allswell hybrid was the solid and durable feeling edge. It not only made for a very smooth and even feeling sleeping surface. But even had a sturdy feel while utilizing the mattress for minimal sitting. If you are looking for a mattress that can be shipped in a box that still has very good edge support, the Allswell hybrid would be a great option. The Allswell Luxe hybrid comes in at $585 for a queen size. This also includes 100 night sleep trial and a 10-year limited warranty. The shipping on this mattress is free for standard shipping. As well as the option to upgrade to 2-day expedited shipping for only $50. This mattress comes in at a great price point and is very affordable for thick, durable hybrid mattress. Also, the bedding options make this one stop bedroom shopping easy and fun. Check out more about the Allswell curated bedding in our blog, HERE! The Allswell Luxe hybrid mattress is a firmer feel and uses 3 layers as well as a cover with a built in plush topper. The cover is a luxe fabric that is cool to the touch. Under this cover is a plush topper that uses 3 foams to create an extra layer of softness. They include 1″ of 2lb memory foam, .25″ of 1.5lb super soft foam and .25″ of 1.125lb super soft foam. Under this plush topper is the first foam layer. This is 1″ of 2.75lb Air Flow Foam. This layer is great for a breathable yet contouring foam for great comfort and pressure relief. The second layer is 2″ of 1.7lb super soft foam. This foam will provide deep comfort and create a transition between the coil system and top comfort layers. The base is a 7.5″ 13 gauge pocketed coil system. These coils are individually wrapped for minimizing motion transfer. They are also great for providing precise support and overall durability. The Allswell mattress has a 100 night sleep trial period. This is the online mattress industry average and what is typical offered. 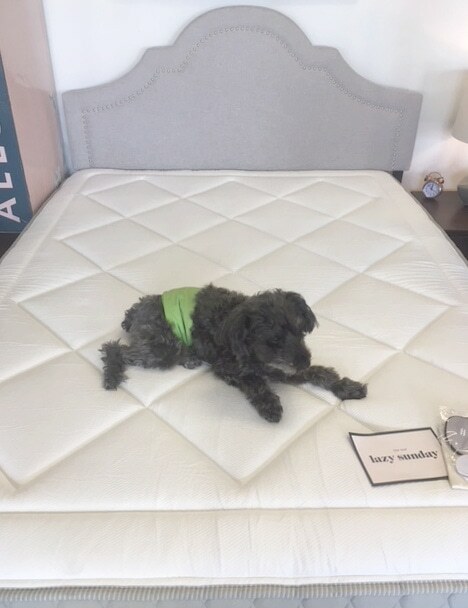 This trial period allows for a sufficient amount of time to see if this mattress is a good fit for you and also has a very easy return process if it isn’t. Allswell offers a 10 year limited warranty. 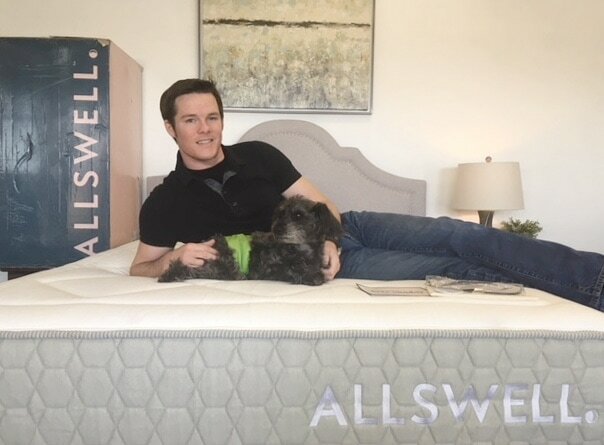 Like most mattress warranties the 10 year the Allswell warranty is prorated to coincide with the natural average wear of the bed over time. This warranty is fairly standard and provides consumers with the confidence that this is a product that the company will stand behind. If you are looking for more specifics for the Allswell warranty or trial period, find out more at allswellhome.com. Or for a helpful tool check out Our Mattress Warranty & Trial Period Guide. 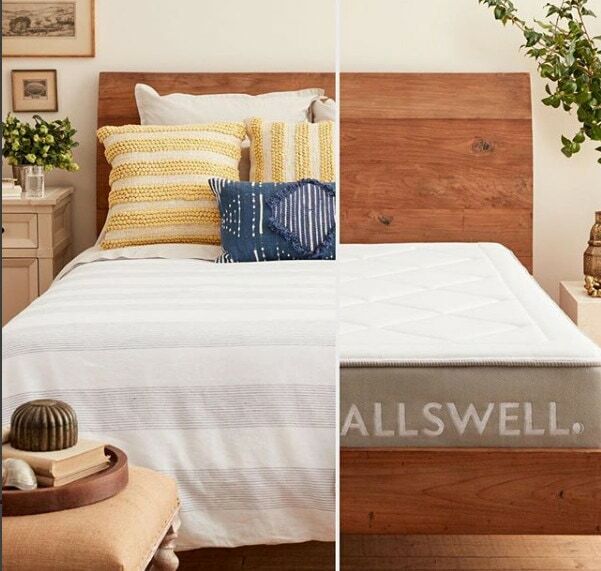 Allswell Home Discounts & Coupons: HERE! This mattress has plenty of rave reviews… below are just a few! 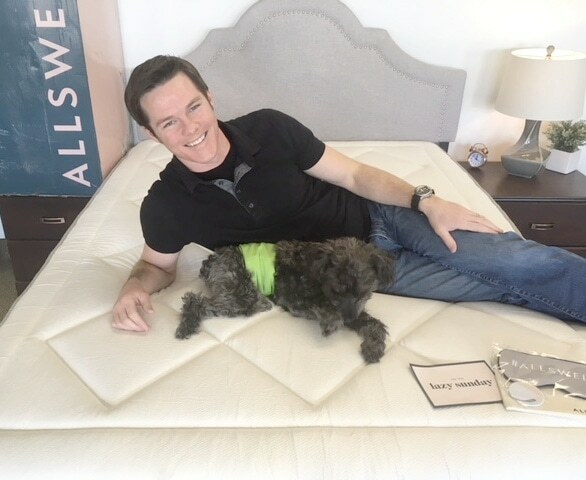 “I chose the Allswell Luxe Hybrid because I was looking for a foam or hybrid mattress that was on the firmer side. That being said, it is firm… and soft. It provides exactly the kind of support I was looking for, along with just the right amount of softness and ‘give’ in the top layer. I switched from a very firm coil mattress and, perhaps not coincidentally, my lower back pain went away almost immediately.” – David A. “This mattress is wonderful. Firm at first but I’ve had for two months now and it’s wonderful. 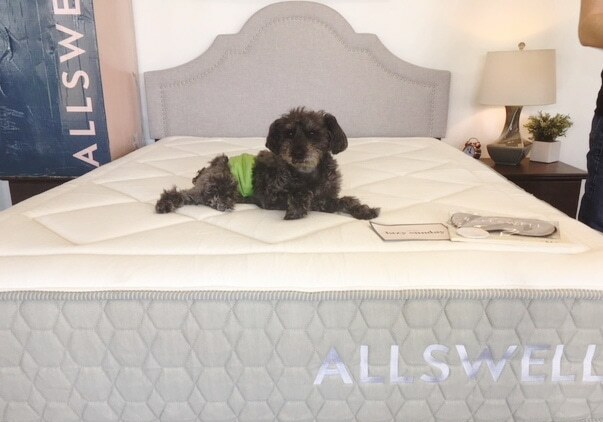 Not only would I recommend to friends and family… I’d recommend to my upstairs neighbor so life is spring squeak free for all.” – Rachel S.
Get more details and see more reviews of the Allswell Luxe Hybrid at AllswellHome.com. Overall the Allswell Luxe Hybrid mattress performed quite well. The price is very competitive and the quality and materials proved to make for a substantial mattress that provided good support and comfort. Keep reading to get all the details on this bed. If you like a thicker, medium firm feeling hybrid mattress that is still soft enough to work for all sleeping positons. You want a very solid bed that has great edge support, minimal motion transfer and sleeps fairly cool. You like a mattress that is more budget friendly and from a company that offers additional unique bedding as well. Still looking for some more information? Visit Allswell at allswellhome.com. Also, have questions for us? Please contact us and we would be happy to help you!